President Trump illustrates the jump in the regulatory code between 1960 and 2017. One of President Donald Trump’s first actions after entering the White House was beginning the process of rolling back the regulatory onslaught of his predecessor. As 2017 comes to a close, he should be pleased with the good start. President Trump issued Executive Order 13,771, in January, ordering the executive branch regulatory agencies to roll back two regulations for each new regulation issued. On December 14, the Office of Information and Regulatory Affairs (OIRA) unveiled a preliminary estimate of the regulatory reform actions taken by the Trump administration through the end of fiscal year 2017 (September 30). From the end of January through September, the administration completed 67 deregulatory actions to only 3 new regulatory actions and reduced the regulatory burden by $8.1 billion (net present value of lifetime burden) or $570.4 million annually. Despite media attention largely focusing on how the numbers released by OIRA do not back up President Trumps claims about deregulation, or how the deregulatory efforts are really not that impressive after all, the deregulatory actions taken this year stand out by historical standards. Each year OIRA reviews “significant regulations” as defined by Executive Order 12,866 totaling on average a few hundred per year. Of those, a substantially smaller number of regulations are economically significant, meaning they carry costs greater than $100 million per year. OIRA catalogs these most costly rules each year in an annual report to Congress, in which it reports the estimated costs and benefits of the rules. Since 2009, that has meant about 14 new major regulations each year, with estimated costs totaling about $12 billion annually. In comparison, in fiscal year 2017, there were only three new regulations put on the books while 67 deregulatory actions were completed, and the total annualized cost of new regulations was negative $570.4 million. Thus, instead of adding 14 big new rules and adding another $12 billion to the cumulative burden of regulations, this year the federal government, on net, reduced the number of new rules and reduced the cumulative burden of regulations. 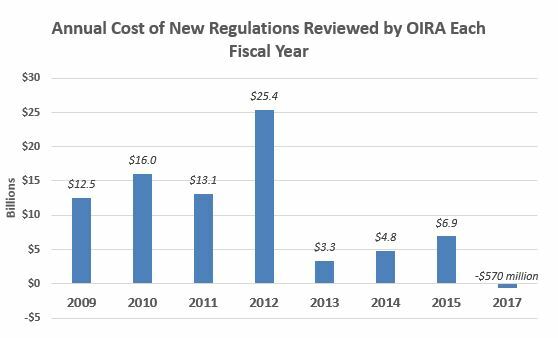 This is the first time since OIRA began reporting that the number of new rules has been so small and that the annualized change in the regulatory burden has been negative. This is an important result that deserves repeating – for the first time the cumulative burden of regulation has been reduced. One additional reason why the fiscal year 2017 regulatory burden should not be overlooked is that the task of accomplishing major deregulatory actions is significant and despite nearly 11 months on the job, this administration has only finished a very small percentage of the deregulatory actions that have been initiated. Much of the work to undo the biggest rules targeted for rollback is still underway. For instance, the EPA is in the process of repealing and ultimately potentially replacing the controversial Clean Power Plan (CPP) and Waters of the U.S. (WOTUS) rules, both issued in 2015 and both longstanding U.S. Chamber priorities for immediate regulatory reform action. The repeal actions for both rules have been issued as notices of proposed rulemakings and the agency is taking comments. The annual cost reduction for those two rules alone would be a minimum of $4 billion per year in 2020 peaking to as high as $34 billion per year by 2030. These cost reductions are substantial by any standard. The preliminary report on regulatory reforms for fiscal year 2017 was big news. To recap: Many regulations were repealed, only three significant new rules were issued, and the total new annual regulatory cost added to the cumulative total was negative $570.4 million. We should keep in mind that most years, regardless of the party in office, the federal government issues many costly new rules, adding billions per year to the cumulative burden, and that avoiding those additional new rules, let alone reducing the cumulative total, is a big win for American business. Going forward, we should expect even more of what we saw in 2017 as the larger scale regulatory reform efforts, such as those at the EPA, begin bearing fruit. Regulatory reform is hard work, and achieving meaningful reform and eliminating harmful rules takes time. But if 2017 is any indication, we should see good results in the next few years. Joe Johnson, Ph.D, serves as the Executive Director for Federal Regulatory Process Review and Analysis in the U.S. Chamber's Environment, Technology, and Regulatory Affairs department.